Have you considered KARATE for interesting fitness, improved negotiating effectiveness, fun, family activity, friendships, greater confidence and self defense? Traditional karate enhances several facets of life by offering interesting fitness, practical and meaningful self defense, sport, and most importantly healthy personal development. 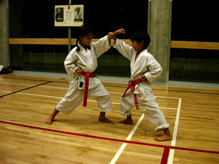 The Vancouver Shotokan Karate program is tailored to offer these benefits to all ages and abilities. Usually participants are 8 years and older. Classes are available which encourage multiple family members to participate and enjoy karate together, sharing common time together in a fun, healthful yet challenging pursuit. Since karate appeals to various ages, male and female, it offers the opportunity for common interest across various family ages and members, enabling the benefits of pleasurable shared experiences which promote healthier families. Karate participants engaged in executive/business environments have expressed excellent personal improvement in negotiations, meetings and interviews through the calming, focus, timing and strategic aspects constantly worked in karate training. 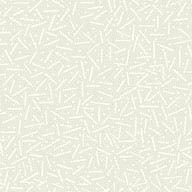 Bullying situations can be a very unfortunate and sometimes devastating part of growing up. These situations can be physically dangerous and destroy self esteem, while pressing academic performance and personal relationships. Karate is based on very individual goals, effort, progress, and achievements and so the joys and positive benefits of personal success are available to all participants, individually at their own pace to their own schedule within their own limits and situation. This promotes confident achievers that feel good about themselves, and they are far less likely to become victimized. Sport karate and karate tournaments are available in the program at all levels and abilities from friendly local to world level, for those interested. For those with physical disabilities, an EMPOWERMENT class is also available. Become empowered while enjoying the confidence and self esteem from a "can do" atmosphere of martial arts which includes mental discipline, adaptability, self defense, and strength from accomplishment. The program is adapted to your physical disability. Although self defense is taught to begin with avoidance and not being there, skills are groomed for escalated situations that require more forceful and experienced responses to better avoid being victimized. Teenagers sometimes seek non-conformity and independence and find that the individuality they seek can be found in a karate class where they actually get rewarded for shouting and setting their own goals. 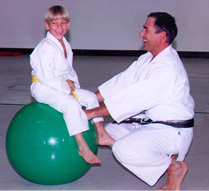 Training is interesting inclusive fitness for all ages and classes emphasize a safe karate training environment. Vancouver Shotokan Karate is proud to be in partnership with the District of West Vancouver Community Services in offering this outstanding program in their new state of the art recreation facilities. Come by and see for yourself! Try a class!